If you don’t want to know who Jude Law is playing in Captain Marvel, don’t look at his action figure for the film. The folks at Hasbro sent ScreenCrush a box of Captain Marvel toys today. 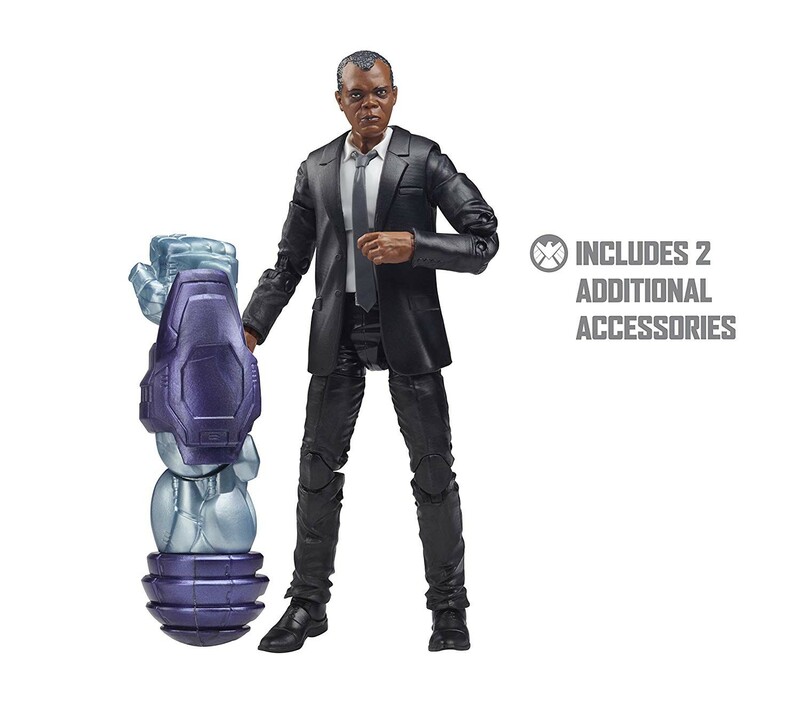 It includes several action figures — including several versions of Brie Larson’s Carol Danvers, a Skrull, a young Nick Fury with an eerily accurate Samuel L. Jackson likeness, and a guy named “Yon-Rogg.” Unlike the Captain Marvel action figure from the same set it doesn’t include an alternate head without his helmet, and with just the lower portion of his face visible, it’s not 100 percent clear who exactly Yon-Rogg is meant to be from the figure alone. But the image on the side of the packaging leaves no doubt: Jude Law is Yon-Rogg. I’d know that stubbly chin anywhere. Before Caron Danvers inherited the mantle of Captain Marvel, that title (at least in Marvel Comics) belonged to a member of the Kree alien race named Mar-Vell. (Get it?) Mar-Vell was sent to Earth on a mission to covertly observe our planet’s technology and scientific developments. Instead, he accidentally becomes a super hero, as he finds himself reluctantly thrust into situations where he has to save humanity (including a woman named Carol Danvers) from various interstellar threats. The persistent rumor for months and months was that Law was playing Mar-Vell in Captain Marvel as a kind of mentor figure to Brie Larson’s Danvers. There’s a catch though: Yon-Rogg was not only the original Captain Marvel’s commanding officer, he was also obsessed with destroying him. The early Captain Marvel issues, most written by Roy Thomas, illustrated by Gene Colan, and edited by Stan Lee, focused on the complexities of Mar-Vell’s life on Earth. He’s supposed to remain dispassionate about mankind, because while he’s only observing their behavior for now, the time may come when he’s called upon to destroy them. Meanwhile, Yon-Rogg is obsessed with Mar-Vell’s romantic partner Una, their spaceship’s medical officer. Yon-Rogg thinks if he can kill Captain Mar-Vell in a way looks accidental, he can then claim Una for himself. So he constantly tries to put Mar-Vell in deadly situations in the hopes he’ll kick the bucket. Here’s a pretty typical example of the sort of chess games that go on between Mar-Vell and Yon-Rogg, from November 1968’s Captain Marvel #7 by Arnold Drake and Don Heck. As a result of Yon-Rogg’s machinations, Mar-Vell is put on the equivalent of trial (he’s actually interrogated by Ronan the Accuser from Guardians of the Galaxy, who also will appear in the Captain Marvel movie). That’s Yon-Rogg in the blue-and-white costume. In other words, Yon-Rogg is Mar-Vell’s commanding officer and a brave leader of the Kree alien race. A “hero among the Kree,” as the action figure copy puts it. But secretly, he’s a total jerk wad. I expect we’ll see something similar from Jude Law in Captain Marvel. He will likely give the outward appearance of a cool Kree cat (or kat), while secretly working to undermine Carol Danvers in some way. The details will be different — it’s not clear Mar-Vell is in the film at all, so there will definitely be some deviations from the source material here. But it would be very out of character for Marvel to name this guy Yon-Rogg and not have him bear at least a strong similarity to the comic book version. Captain Marvel opens in theaters on March 8. The Captain Marvel toys are available now. The Sam Jackson likeness on the Nick Fury is uncanny. Is Captain Marvel’s Cat Secretly Evil? Source: Who Is Jude Law Playing in ‘Captain Marvel’?